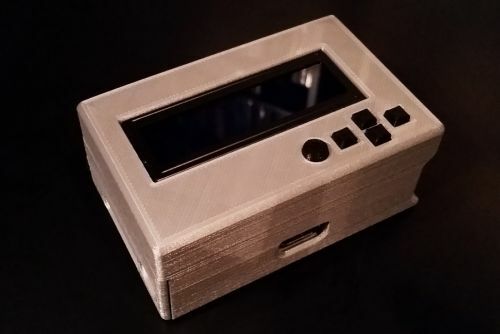 A 3D Printed housing for use with a Pi v1 (The Discontinued Pi 1 Model B) as well as the Adafruit PiPlate Character LCD Keypad (newer version with buttons on right). This is a popular setup for use with Net-Booting of a Sega NAOMI, NAOMI2, Chihiro or Tri-Force arcade boards with the Pi-Force Tools or NaoPi software. Printed in PLA with your choice of colors, this housing helps keep the electronics protected while also providing a clean utilitarian look Designed for easy assembly with no fasteners and no tools required. Includes the top and bottom case, and button extensions. DOES NOT include the Raspberry Pi board, LCD keypad board, or SD card. We recommend the use of the BaseQI PiDrive Micro SD Card adapter (not included) as it is short enough that the SD card will not protrude beyond the case. Click here for a comparison of the Pi Drive adapter, the Adafruit Shortening Adapter and a Full Sized Card. Unsure which version of the Pi you have? Click here.